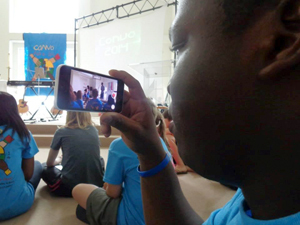 Photo right: A picture taken by Jackson Roberts shows a participant from CONVO 2014 capturing the fun on his iPhone. Photo below right: The Saturday night beach worship happens on the last day of CONVO. In a few days, youth from across the Mississippi Conference will gather for CONVO 2015 at Seashore Assembly in Biloxi, Mississippi. For the last 30 years, this annual youth retreat has taken place. CONVO convenes this year July 10-11. Organizers anticipate the attendance will be around 250. Mike Howington, the youth and families coordinator for the Mississippi Annual Conference explains how this event is unique. "We'll see student leadership throughout the weekend in different capacities. A lot of times when students go to camps, they don't get to see peer leaders. This is one of the environments in which we get to do that," said Howington. 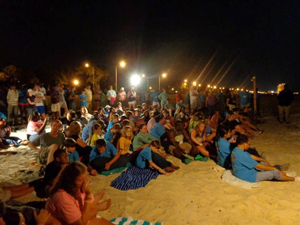 The Saturday night beachside worship is another distinctive experience of CONVO. The Rev. Sapada Thomas, a provisional elder in the Mississippi Annual Conference of The United Methodist Church, will be the guest speaker. A video recap from CONVO will be shared later this summer. CONVO is an event of the Mississippi Annual Conference led by the Conference Council on Youth Ministries (CCYM). Registration for CONVO 2015 closed on July 5. However, registration is open now for the next youth event, The Gathering 2016.